I am a morning grump. There. I said it. It’s hard for me to bounce out of bed and start slaying dragons. I like the day much better when I can relax with the morning newspaper (yes, the print version) and a cup of hot coffee. Often I muffle my way to the local coffee shop down the street and let them make it for me. Espresso. Two shots reg/one shot decaf. Room for cream. I’ve talked about this before, my 95% vegan approach to nutrition. The remaining 5% covers that dollop of cream I refuse to give up. But as the season progresses, and the cold transitions from renegade invader to an impenetrable squadron in full body armor, trailing along with it is another invisible force: the cold virus. That’s when I trudge out my own arsenal: green tea, mullein tincture, wild cherry bark syrup for coughs. Green tea on a cold winter morning warms several ways, of course. There is the ritual of tea-making itself–filtering the water to get rid of chlorine and restore sweetness, waiting out the heating of the water in a vague meditative state augmented by the spooning of leaf into the teaball (or the less aesthetic opening of the teabag). Then the steeping, which by its very nature is another wait, another chance to slow the self way, way down to the point of opening the kitchen shade while it is still dark to peer for the glow of squirrel eyes, since one or the other of them always seems to be awake and scampering, as soon as we are, it seems. Once the tea is made, the movement resulting in the night body having loosened itself, eased muscles into service, then the tea is cupped, literally, in the hands, functioning as a small furnace from which flavored steam arises. Lastly–and we all do this, I know we do–we inhale that steam, are further warmed and awakened by it, and then we blow across the top of the mug to cool it just enough so that we may survive that first too-hot sip without burning the tongue because none of us–not one–can wait until it has cooled down on its own. That is the lure and the draw of tea. I like to put green tea into service as medicinal, too. Add a few saffron threads to boost mood. Ginger makes it a good stomach tonic, as does peppermint. For colds and flu, brew it with mullein leaf (see the discussion on mullein leaf in Blue Moon Vegetarian p. 47-50). Mullein has been used for millennia for the treatment of upper respiratory symptoms, including congestion, ear infections, and asthma. It grows throughout North America and the leaves are easily harvested, although you can also buy it dried and packaged at health food stores. 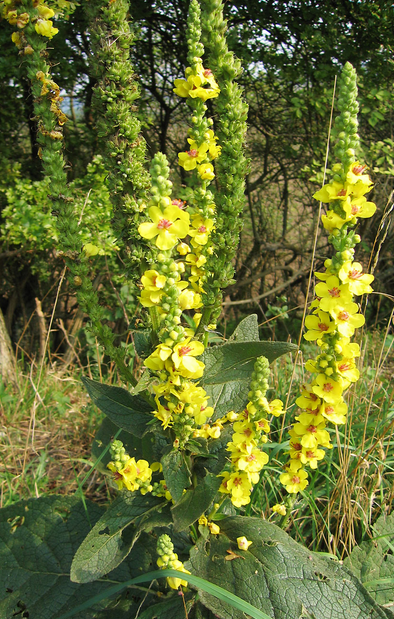 Be careful not to consume plants with deformed stalks as mullein absorbs pollutants–particularly from automobile exhaust–and avoid the seeds, as well, as they also contain toxins. Wild cherry bark is what my grandmothers used to treat coughs and colds. My experience mirrors theirs: a few doses is all it takes to knock out the worst virus. Take it throughout the season to ward the buggers off altogether. My father tells the story every year, of how his father would peel the bark off a wild cherry tree and Grandma would cook it down in honey and water. The kids would be fed a tablespoon of it each, and in a day or so their illness had vanished. He says people rarely got sick, but when they did, wild cherry bark was the thing they went for. This particular recipe merges 4 very powerful herbal remedies that will get you through the flu season in a rather dramatic way, and warm you inside and out in the process. Best not to use if you are pregnant. Mild enough for children, but, as with all remedies, consult a physician or naturopath before using. Place dry ingredients in closed jar and shake thoroughly to blend. Spoon into cheesecloth and tie off, then pack into a tea ball. Place ball into mug and cover with boiling water. Steep covered for 15 minutes. Sweeten with agave syrup.